The 7 Best Humbucker Pickups – Fat, Powerful and Zero Hum! Want a tone with some power and meat, but without all that irritating hum? You’re in the right place, as the humbucker delivers almost everything the modern guitarist needs. Humbuckers are hugely popular pickups in the world of modern rock and metal, although have actually been around for a long time. Technically as far back as 1934, when the first twin-coiled guitar pickup was created as an alternative to the noisier, weaker-signaled single-coil pickup. However, it was Gibson employee Seth Lover who developed the hum-cancelling PAF pickup – considered the first true popular humbucker – in 1955, with Gibson’s Les Paul the first guitar model to bring humbuckers to the masses. As time went on, humbuckers became a popular pickup with many brands – even seen on Fender Telecasters and Stratocasters, which are famously single-coil guitars. These days it’s quite common to see a Strat with two standard single-coil Strat pickups sitting above a humbucker, in a H-S-S configuration. We’ve put together a short guide to everything you need to know to get started with humbuckers, as well as a chart that highlights seven awesome models. While there are certainly more than the seven pickups we suggest, these are some of the most popular on the market today, showing great power, style and value. 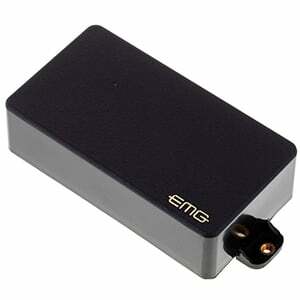 An active EMG humbucker with a huge output. 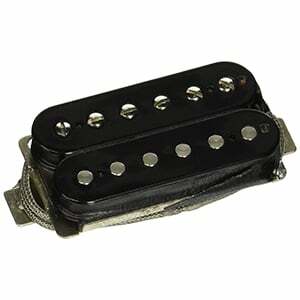 A versatile vintage humbucker with smooth PAF tones. Beefy rhythm and cutting lead tone from this legendary humbucker. A classic from DiMarzio, offering big output but good balance. One of the most popular humbuckers for metal and rock! A pickup that delivers the desired EVH brown sound! A rare appearance for an active humbucker on our chart, but this popular EMG 85 certainly deserves its place for its huge output and natural tone. With Alnico V magnet-loaded close aperture coils, the EMG 85 delivers a satisfyingly meaty bass, a well-defined mid-range, and a thick treble that’s a real joy to listen to. While this is one loud humbucker, it retains superb clarity even when cranked up to 11, and it remains silent when not in use – perfect for gigging guitarists. It’s great for the neck – complemented by its famous brother, the EMG 81, in the bridge. However, the EMG 85 also sounds equally solid in the bridge position. For the price, it shows very good value – well worth the cash. While this list is dominated by humbuckers that focus on aggressive, crushing distorted tones, the Gibson ‘57 Classic Plus humbucker is a little subtler. Having said that, it can still rock, with a reassuringly high output and saturated crunch sound. However, its main draw is the rich, vintage tone akin to the original PAFs of the late 1950s. Made with a slightly overwound special Alnico II magnet, the tone on offer is seriously smooth whether played cleanly or with high gain, and provides a versatile vintage option to any guitar. Whatever your axe, the ‘57s should fit the feel, coming in both uncovered (black or zebra) and covered (nickel or gold) styles. All are wax potted, for quieter performances. Quite expensive, but a worthy investment! If you love your Strat, but want a richer, more powerful sound, this Hot Rails SHR-1 bridge pickup should be first on your list. It crams all the power of a humbucker into convenient single-coil package, which is easy to install into any single-coil guitar. One of Seymour Duncan’s highest output pickups, this wax-potted ceramic humbucker offers a full-fat, beefy tone with great sustain, that’s as good for heavier music (Iron Maiden’s Dave Murray using these pickups is a good testament to that!) as it is played cleanly for country, blues and funk styles. Available in black or white, it shows off the classic Hot Rails looks. For well-under $100, this humbucker also shows off great value. An all-round winner! When it comes to metal, it’s hard to find many tones greater than Dimebag Darrell’s – and this awesome SH-13 Dimebucker from Seymour Duncan packages that tone up for the masses. With a ceramic bar magnet and two stainless-steel blades, this humbucker delivers a massive, meaty tone that combines a deep low-end with mix-cutting highs. This means it’s a winner for crushing metal rhythm or blistering solos, and intense pinch harmonics are sensational. In a 2004 interview, Dimebag said of the SH-13, ‘If you ever listen to a Pantera record, that’s what you’ll hear through this pickup.’ Fittingly, the face of the pickup features a print of Dimebag’s signature, should you need reminding of who you owe thanks to for that beefy tone. You can’t call a humbucker ‘Super Distortion’ unless that’s what it delivers – and DiMarzio certainly does not lie with the DP100! The Super Distortion was the first pickup designed to send a tube amp into complete overdrive, and remains one of the highest-output humbuckers money can buy. Great at the bridge for rhythm or lead, it’s a well-balanced pickup offering a big fat low-end, screaming highs, and boosted mids. Perfect for classic rock, metal, and everything in between. Note that, while the actual design is nothing special, this humbucker is available in a rainbow of colors, including black, white, pink, blue, chrome and even camouflage, to name a few. A casual warning – when purchasing, make sure to select the correct size for your guitar. 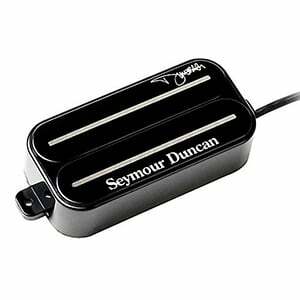 Perhaps the most popular humbucker on the market today is the SH-8 Invader from Seymour Duncan. And it’s completely justified – this humbucker rocks! Output is huge, with the SH-8 delivering a massive, fat, thick sound that’s perfect for the heaviest, darkest metal, just as well as lighter punk rock. It excels when distorted, although probably won’t appeal to the subtler player as its clean tones are a little shrill. Low-end is satisfyingly deep, although chords and single notes remain clear, even at the highest volumes. Handmade in California, these pickups are crafted with three large ceramic magnets, overwound coils, and use oversized metal oxide pole pieces to give a simple but striking appearance. Despite its aggressive nature, the SH-8 remains silent in terms of hum. There are two ways to sound like Eddie van Halen – practice 24 hours a day, indefinitely. 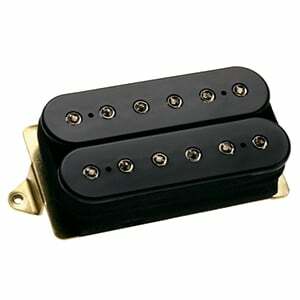 Or get his signature Frankenstein humbucker, which guarantees at least you’ll get the searing tone you’re looking for. While it may not look particularly interesting, this bridge humbucker is built to the exact specifications as the pickup on van Halen’s original Frankenstein. Low-end is tight and deep, while the highs and harmonics shimmer and sing, cutting through the mix with ease. On clean it’s bright and clear, although it’s happier when overdriven, and is perfect for everything; blues, classic rock, metal and – naturally – EVH’s ‘brown sound’. 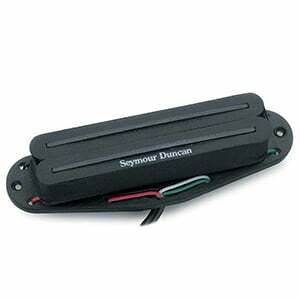 There may be better value pickups out there, but this adds instant character to any guitar. Now get practicing! While single-coil pickups offer a beautiful clean, clear, sparkly sound, they also pose a problem. As soon as the gain or volume increases, so too does the interference from ambient magnetic fields around the guitar – arriving in the form of hum. Which is no fun. Humbuckers were created to remedy this. Their overall construction is not too dissimilar to a single-coil, comprising magnetic poles/slugs wrapped in a hair-thin wire, sandwiched between two ‘flats’. However, unlike a single-coil, humbuckers have two coils (and therefore two sets of pole-pieces). These are wired out of phase with each other, so the hum generated by the first coil is cancelled out by the second, and vice versa. This ultimately boils down to a pickup with no unwanted hum, keeping guitarists happy as they crank up the volume and the gain. A guitar loaded with a humbucker is capable of some delightful sounds. While the exact tone will differ depending on the brand, price and the construction of the pickup, as well as the actual guitar they are fitted to, a typical good-quality humbucker delivers a thick, round, rich and warm sound, with a meaty low-end, emphasized mid-range, and rounded trebles, as well as great sustain. In modern music, humbuckers are a huge deal. While jazz players love the warmth of a humbucker, pretty much every heavy style of music relies on them for their rhythm and lead capabilities – classic rock, heavy rock, and punk rock in particular, while humbuckers are also undoubtedly the best guitar pickups for metal and its many subgenres. As for legendary humbucker players, just take your pick from this list of mega stars: Eddie Van Halen, Dave Mustaine, Tony Iommi, Jimmy Page, Dimebag Darrell, Joe Bonamassa, Randy Rhodes, and Steve Vai. While they may seem perfect due to their tone, power and interference-cancelling abilities, humbuckers are not without a drawback. In particular, humbuckers don’t have the brightness or clarity on offer from single-coils, so aren’t ideal for musical styles that rely on chime or twang – surf or country music for example. When it comes to pickups, you have a choice between active and passive. If you’re not sure what pickups are on your guitar, chances are they are passive. These are the most popular, and used in most styles of music – from classic rock, punk and early metal, to blues and jazz. However, since the 1980s, active pickups have become more common, especially in the heavy rock and modern metal genres, where their unrivalled power and zero hum make them a sensible choice. There are several pros and cons of each style, and it’s worth checking out this excellent comparison article on active and passive pickups from pickup kings Seymour Duncan. It’s a good question. Some guitarists won’t think twice about keeping the stock pickups on their guitar. However, changing the humbuckers is a great way to wake up your favorite guitar – adding some extra depth, clarity and power. When it comes to cutting costs, especially on budget models, most guitar manufacturers will usually look towards the pickup area to keep their profit margins intact, inserting stock models whenever possible. Not that there’s anything wrong with stocks. But as you and your playing become more advanced, a new humbucker from the likes of Gibson, DiMarzio, Seymour Duncan, or EMG can have you sounding another level, very quickly. Whether you’re chasing the perfect metal sound or just want to give your favorite axe a new lease of life, a good humbucker will usually do the trick. And the seven we highlight in our chart should give you a little inspiration when making your shortlist of humbuckers to suit you. Make sure you don’t dive straight in and buy the first ones you see – read some reviews, check out some videos, and listen to a couple of audio files of your shortlisted pickups before you make your decision. All the best with your new humbuckers! I’m a bit surprised that Lindy Fralin Pure PAF pickups are not listed. I’ve used several different humbuckers and Fralin Pure PAF’s really stand out. So, I have and Ibanez AMV10A-TCL and Im looking to chang the stock pickups it has, they are pretty bad I must admit, but I have no idea what to buy, I would appreciate some advice thank you! Big brands are good, but I’d like to see more than SD and Dimarzio. I’ve been a big fan of Lollar single coils and Darkmoon vintage humbuckers. Give us some variety, please. Just install any good brand of pickup but make sure your amp has a top quality speaker. 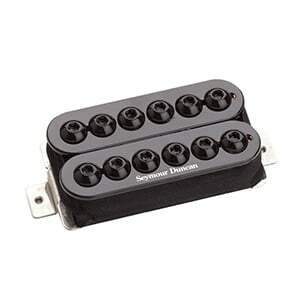 The Seymour Duncan SH-8 Invader is indeed a great pickup. For being such a hot pickup it’s surprisingly versatile. The guitar I had it in was the Tom Delonge Signature Strat. In fact he liked the Invader so much that it was the only pickup on his strat. I’ve had mine for 12+ years now and it’s still rippin. If the pole pieces get rusty, just head to a local hardware store and get some new ones. Great pick.